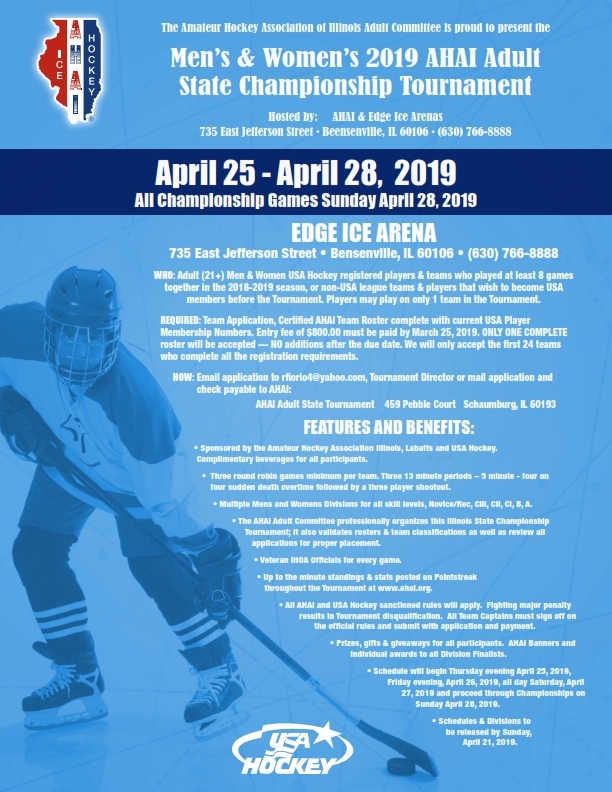 The Amateur Hockey Association Illinois, Inc. is proud to present the 2019 AHAI Adult State Championship Tournament hosted by the AHAI Adult Committee and The Edge Ice Arena. The Adult State Tournament will take place April 25 – April 28, 2019 with all Championship Games taking place on Sunday, April 28, 2019 at The Edge. For more information please see flyer below or contact Robert Fiorio, Tournament Director at rfiorio4@yahoo.com. Click HERE to download/print flyer and registration form.